ATLANTIC CITY — James Rahn swings the Honda Accord to the side of North Maine Avenue so he can sniff the ocean air. “It’s nice, right?” he says, a gravel-voiced question, technically, but not one that awaits an answer. His stories are big on smell. His book Bloodnight, a collection of semifictionalized memories of growing up tough in this forlorn city, begins with a fifth-grade trauma. He gets in a fight with a kid named Ronnie Shepherd, who hurls him off a low roof, and, as the narrator lies on the ground, wrists snapped like twigs, he takes in the clammy funk of the bay at low tide. We’re taking a tour of his old neighborhood, passing pale tourists, haunted street people, and gleaming castles of chance. Every time he comes home, he feels “jangly.” Displaced. He grew up in pre-casino Atlantic City, a ghost town that rolled up its Boardwalk each September after the Miss America people went back to wherever they belonged, leaving a patchwork quilt of warring ethnicities. Rahn’s people were relatively landed. Since 1922, they’d had a nice house on North Plaza Place in a neighborhood called Lower Chelsea. His grandfather, Joseph Poland, was a big deal, chief of obstetrics at Atlantic City Hospital, and the county’s medical director. To have a position like that back then, you had to be in with Enoch L. “Nucky” Johnson, Atlantic City’s political boss, whose exploits Boardwalk Empire has dramatized. The thought has occurred to Rahn that his grandfather must have been Nucky’s man. Maybe that’s how Rahn’s father got his job as elevator boy in the Ritz-Carlton, where Johnson ruled the town from his eighth-floor suite. Rahn was only 8 when his father died. His closest sibling in age was 11 years older. “I was angry,” Rahn says, explaining his journey from dentist’s son to juvenile delinquent, how he dropped out of high school in his junior year after being inducted into a notorious fraternity called Bones. We skip the bivalves and go for lunch at Sack o’ Subs across the line in Ventnor. A kid was defined by the sub shop he frequented and the schoolyard where he played ball, says Rahn, 57, white-bearded but still fit. He was Jimmy from the Super Sub Shop and Richmond Avenue School. He orders a cheesesteak and fountain Coke, then a cup of coffee, which he ignores as he tells more about himself, his hands wildly gesturing. A lot of times in his life, wherever he happened to be, people would ask him what he was doing there — at the newly formed Stockton State College, where he spent two years after acing his high school equivalency test; at the University of Pennsylvania, where he went next, earning a degree with honors. Fast-forward a couple of years. Rahn was in Miami Beach, working in the bowels of the Fountainbleu Hotel, strapping vinyl onto chaise longues. He read that the editor and writer Gordon Lish was teaching in a master’s program at Columbia. 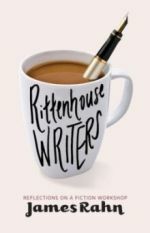 Rahn got in, earned an M.F.A., and moved to Philadelphia, where, in 1988, he rented a room at the Ethical Society and held his first writers’ class. Over the years, 20 books emerged from that room to be published. Anyone who knew Rahn heard he was writing a novel about his boyhood in Atlantic City. Yet the book still didn’t come. He stopped revising and started winnowing what didn’t fit. A book took shape. Bloodnight, published by Aberdeen Bay, tells his coming-of-age stories through a variety of characters over 117 violent, sexual, barely exaggerated pages. The book never mentions Atlantic City by name. Rahn calls his home Marvista. “That freed me to write honestly about the place,” he says, as he searches for his favorite view on the south end of the island. At the end of South 22d Avenue in Longport, he pulls over once more, then lingers before a perfect Shore scene: a horseshoe crab, a gull, and piece of driftwood spread out before the sand. The houses are mansions, each a different style.